AALL voices the needs and interests of law librarians on timely policy issues including copyright; equitable, no-fee permanent public access to authentic online legal information; open government; and privacy. But no one knows the issues that impact law libraries across the country better than you. As a constituent of your elected officials, you hold the power and authority to influence your legislators’ opinions. After all, you’re responsible for re-electing them! Your lawmakers want to know what you think about issues that impact law libraries and it's your responsibility to help them understand the issues that matter most. Make your voice heard and help to influence the policies that affect you. AALL’s Advocacy Team is comprised of passionate members around the country who are committed to influencing information policies at the federal and state levels. In Washington, DC, AALL’s government relations staff champions the policy issues affecting our members by acting as the face of the Association to Congress, the administration, and other government officials. Many AALL chapters also have active government relations programs. Advocacy activities are set in accordance with AALL's Government Relations Policy and in consultation with the Copyright Committee, Digital Access to Legal Information Committee, Government Relations Committee, and, where necessary or appropriate, the President or Executive Board of the Association. AALL advocates on many critical information policy issues, including appropriations for the Government Publishing Office and Library of Congress, copyright, freedom of information, net neutrality, open government, and privacy. AALL frequently meets with Congressional staff, the White House, and agency officials to influence our federal policy priorities. Recently, we’ve had a seat at the table in conversations and decisions about access to authentic online legal information, Section 108 of the Copyright Act, privacy of library users, and more. While the AALL staff lobby on these important issues, we rely on our members to add their voices and personal stories. AALL works with chapters and individuals to ensure greater access to government information at the state level. Recently, we have worked with AALL members and chapters in favor of access to official electronic legal materials and to support funding for county libraries. We also advocate in favor of enactment of the Uniform Electronic Legal Material Act (UELMA), a priority issue of AALL. As members of a democratic society, we have the ability to influence on the way we are governed. Members of Congress listen to the needs and opinions of their constituents to make decisions about legislation. We hope you will take the time to express your values and your priorities to Congress. There are three paths of communication you can take. Click each link below for helpful tips and strategies for communicating with Congress. Visit your Representative and Senators when they’re in Washington, DC or when they’re home. A personal visit is the most effective means of communicating with Congress. Send a message. It's easier than ever to communicate with your members of Congress. You can send a letter, email, or fax to your member of Congress at their home or Washington office. Call your Representative and Senators. Congressional staff are available to answer your questions and hear your opinions over the telephone. Master your elevator pitch to be persuasive. There are many unique opportunities to connect with your state officials that can build critical relationships for advocacy efforts in the statehouse. In addition to meeting, writing, and calling your state legislators, you can interact on a much more personal level. While no two statehouses are the same, you can use the following guides to take exciting opportunities in your state. Host a tour of your library for your state legislator. Write and present testimony at a public hearing. Build strong, unified coalitions for state advocacy. The media can act as a powerful tool of grassroots advocacy by allowing your message to reach a broad public audience. Your voice can help to change the way community members look at issues; create a reliable, consistent stream of publicity for your mission or goal; and motivate the public and policymakers to get involved. Print media is a great place to start advocating. Write an Op-Ed about topical information policy news. Submit a Letter to the Editor in response to something you've read. The ways you can take action for AALL are not limited to those described here. From attending town hall meetings to developing position papers and forming local coalitions of law library advocates, the possibilities for effective advocacy are endless! Former Speaker of the House Thomas "Tip" O'Neill is famous for the phrase, "All politics is local." AALL strongly believes that getting the participation of our members and chapters is essential to our public policy success. 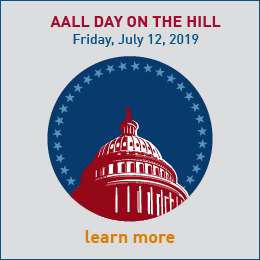 While your government relations staff work hard to advance the policy goals of AALL, it is you who has the power to convince your lawmaker of the importance of law libraries to your community and the Nation. By speaking up for law libraries and taking action when it's needed, you'll become an important member of our Advocacy Team. All it takes is a little know-how and the willingness to speak up on issues that affect our profession. AALL makes it easy for you learn about the issues on our agenda and to get involved. By reading our monthly Washington eBulletin, joining the AALL Advocates Community, and taking action on our current alerts, you'll be part of a successful network of law librarians and legal information professionals advocating for the information policy issues that affect the profession.